For much of 2016, gold’s price action was whipsawed by market speculation about whether or not the Fed would raise interest rates in a final, grand gesture to ring out the month of December, as well as the soon-ending Obama administration. In essence, all year, the golden spotlight has been on Yellen. When pondering the Fed and its impact on gold price trends, there’s one line of questions. Will rates remain the same at the next meeting or will rates increase? If so, by how much? Earlier this year, as markets perceived low probability of a Fed rate increase, gold prices drifted higher, and lifted mining shares on the rising tide. When probability of a Fed rate increase appeared higher, gold sold down and took mining shares with it. As of last week, we have our much-anticipated, end of year, quarter-point rate increase, with accompanying guidance to expect three more rate moves in 2017. Apparently, and notwithstanding Trump and the “jobs, jobs, jobs”-thrust of his recent presidential campaign, the Fed believes that the U.S. economy is strong and getting stronger. Thus, it’s time to raise rates and cool down the overheated engine of growth and employment. Since Donald Trump won the U.S. presidential election, broad markets firmed up and moved ahead, while gold corrected downwards. Here’s a chart that tracks the Dow Jones average ($INDU) against the daily gold contract ($GOLD). You can see the remarkable Dow-gold divergence, beginning right around election day. 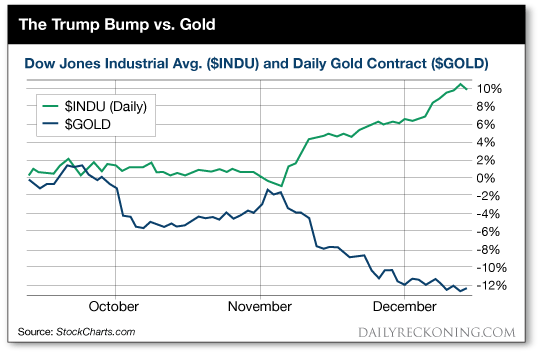 Gold prices took a hit in early October, as the chart shows. At the time, the idea was that the plunge anticipated the Fed’s rate increase in December. Then gold prices recovered, up until the wee hours of election night, when yellow metal began another downward track. So, what does the future hold? Nobody knows. 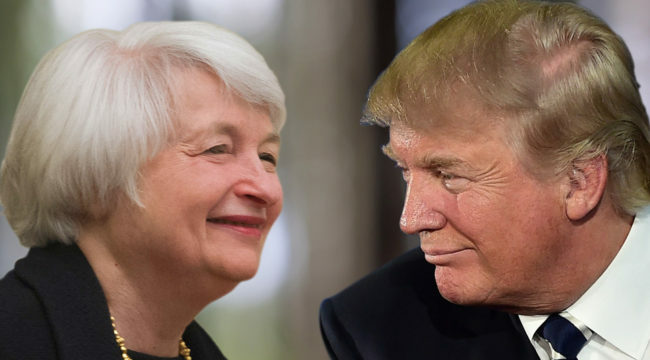 But I expect that we’ll see a true contest of wills between Trump, and his Make America Great Again optimism; versus Yellen, and her sense that the economy is heating up and requires Fed interest rate ministrations to cool it all down. Along the lines of that impending contest of wills, a few weeks ago, I was organizing boxes in my basement. 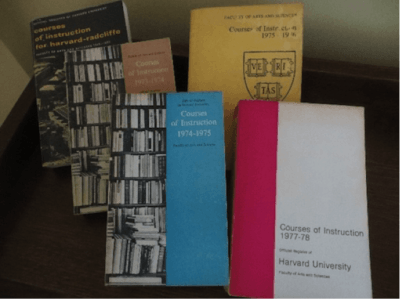 Purely by coincidence, I found a collection of old Harvard student course catalogs from 1972 through 1978 when I studied geology there. Inside these pages are Yellen prophesies! BWK photo. 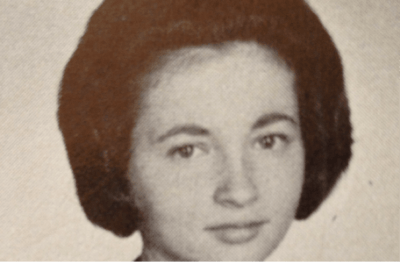 The mid-1970s also covers several years when a much younger Janet Yellen was on faculty at Harvard, employed there as an assistant professor of economics. Janet Yellen, long ago, on faculty at Harvard. Yellen earned a PhD in economics from Yale University in 1971. Her thesis was entitled Employment, output and capital accumulation in an open economy: a disequilibrium approach, prepared under the supervision of Nobel laureates James Tobin and Joseph Stiglitz. Degree in hand, Yellen migrated north to Cambridge, and went on payroll as an assistant professor of economics at Harvard, 1971–76. Yellen had quite a group of distinguished colleagues, back then. While paging through the dusty tomes, I saw familiar names of old professors, from whom I took an economics course or two – Otto Eckstein, Kenneth Arrow, Robert Dorfman, Wassily Leontief. And then there was Janet Yellen, Assistant Professor of Economics, with her bright future still to come. Notice anything about Yellen’s courses? One sees the name Keynes prominently. In essence, Yellen taught party-line, Keynesian economics. Keynesian economists believe that private sector economic decisions often lead to what they perceive as “inefficient” macroeconomic outcomes. The economy just doesn’t do what central bankers and government planners want it to do. People don’t behave properly, at the “micro”-level (call it the “Trump”-level, for current purposes), and their cumulative sins all add up to grave policy faults and inefficiencies. Something must be done to correct the resulting inefficiencies. The policy solution to economic inefficiency is that a modern economy requires active measures by a (supposedly) wise and knowledgeable central bank, working in tandem with effective fiscal policy by the (supposedly) all-seeing, all-knowing government. The idea is to “stabilize output” over any given business cycle. I won’t belabor the preceding points; people write long books about Keynesianism, versus, say, the “Austrian” school of economics. People argue over the merits of recessions, to clean out the muck from an economy. People argue over whether or not to attempt to control business cycles, if that’s even possible. All that, and much more. For our purposes in Gold Speculator, my view is that Ms. Yellen’s deep-down, inner Keynesian instinct is happy to see the downward-sloping $GOLD trend in the chart above. But also, she’s unhappy with that up-trending $INDU line, and certainly with the idea of a Trump Bump, and what it means in terms of her worldview. Yellen, and her Keynesian cohorts at the Fed, will do what they can to reign-in the robust and overheating – she evidently believes – U.S. economy… whether it’s robust and overheating or not. She’s like a doctor with but one standard remedy, no matter what the illness. Thus, as 2017 unfolds, we’re setting up for a battle royale, worthy of Wrestle-Mania at its finest. In one corner, we have incoming, President-elect Trump – with his go-go-go, charge ahead view of moving the economy. With his $3 trillion gathering of tech-heads. With many campaign promises to keep about “bringing back jobs” and such. In the other corner, we have a cadre of PhD-level, central bank policy wonks who really do believe their own hocus pocus. Much of the looming battle will play out in the public forum, and we’ll be able to watch it live, and in real-time. Other elements of this epic battle of monetary policy will be at the Deep-State level, behind tightly closed doors. We’ll hear leaks and rumors, to be sure. And along the way, the price of gold will be one key barometer of whose ideas are prevailing. Exactly. Intellectual chaos. Buy rumors, sell news. Gold will have its day again.